It seems like NetEntertainment couldn't possibly make their many video slot machines even more exciting to play but that's exactly what they've done with a Free Spins promotion. Most promotions happen over weekends and NetEnt is bending the trend by making their Free Spin promotion run Monday to Thursday for the rest of July on their brand new, fun and exciting Wish Master video slot through Euro Casino. Until July 31st, 2014, players can claim up to 1200 free spins through this game and make the best possible use of them to cash in on the jackpot of 900,000 coins and many smaller prizes up for grabs with every press of the spin button. This fantastic offer operates on a one day delay and is based on deposits and bets made across the promotional period. 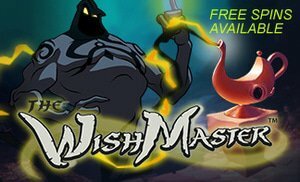 The Wish Master slot machine will be credited with 25, 50, or 100 free spins after depositing $25, $50, or upwards of $100 respectively. This can be taken advantage of for the first four days of every week. Considering the many ways to win across this 5 reel, 20 pay line slot machine, these free spins could us the magic of the genie in the lamp to turn themselves into some serious bankroll. The game itself is fun and easy to play with animated icons with every spin, appropriately fitting artwork and robust music and sound effects that set an adventurous tone for the game. Icons that can be combined on the reels for wins include the card symbols of J, Q, K, and A as well as scorpions, cobras, jaguars, and ravens all holding different coloured jewels. Since there's real magic at work thanks to the titular genie emerging to change the gameplay, these symbols can turn out bigger wins than the pay table lists. The genie escapes from his lamp with a bellowing laugh to spread various kinds of Wilds across the reels in several ways. Wilds take the form of entire reels locked as this favoured symbol, certain symbol groups being replaced by Wilds, and those that are randomly positioned across the game board. Score multipliers up to 3X are available throughout the game to maximize the payout offer as well. NetEnt's fantastic new game, Wish Master, can be played at Euro Casino where the promotion is being held and the extra bonus of a generous welcome bonus is offered to all new players alongside many games with progressive jackpots. This three tier deposit bonus is set up to give 150% back upon the first deposit, up to $150, the second gives a 25% bonus up to $100, and the third is a 50% deposit match up to $50. The Free Spins promotion only runs until the end of the month so hurry to get your share and claim your riches from the genie today with Wish Master.